This week R.J. and I are sharing a book we have to read more than once. I can’t decide on one though. Most of the books I’ve read more than once are about writing. When it comes to fiction, the Dune series qualifies. I’ve read Dune twice and am making my way through the series. The more I read, the more I love it and could read it over and over again. Besides that, I’d really like to read the Harry Potter series through for the second time. Or maybe listen to it on CD. Why these series? I get so wrapped up in the intricate plot of the Dune series, and with Harry Potter, I fell in love with the characters. This is kinda funny, considering I’m a horror writer and my selections are not in the horror genre. For that genre I’d have to answer with The Books of Blood by Clive Barker. For R.J., “reading books twice is nothing new. I always feel it’s like spending time with an old friend I haven’t seen in a while. Anyone who knows me knows I never give away a book, and I have about 60 feet of bookcases in my basement to prove it. “For sheer re-readability, nothing compares to Robert Jordan’s Wheel of Time series. I’ve re-read “Eye of the World” at least ten times over the last 21 years, and amazingly I keep finding more things that he put in to foreshadow future events that didn’t have a payoff until books that didn’t come out until 15 or more years later. In fact the first book still has a scene that has all of WoT fans out there chomping at the bit for answers. Now it’s your turn. What book(s) do you have to read more than once? 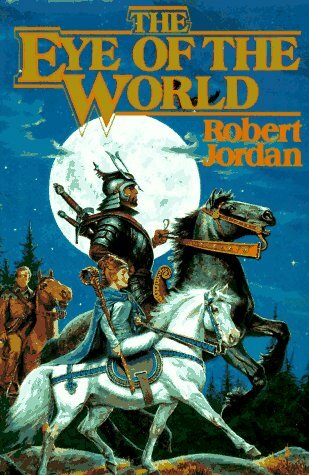 R.J.'s been trying to get me to read Robert Jordan for years.